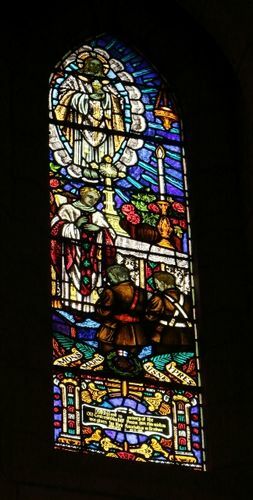 A stained glass window commemorates the Old Contemptibles who served in France in 1914 as part of the British Expeditionary Force during World War One. Members of the Queensland branch conducted their own appeal for funds for the memorial, and the central branch in England contributed £25 sterling. A series of eight windows given by Dr. Bedford Elwell in memory of his wife, were also dedicated at yesterday's service. FOOTNOTE— At least 20 Old Contemptibles will march in the Anzac Day procession on Wednesday. Courier-Mail (Brisbane), 23 April 1951. This window was erected to the memory of members of Forces under Field-Marshal Earl French of Ypres described by the enemy as England`s "Contemptible Little Army" which in France and Belgium during the period from 5th August to 22nd November, 1914, successfully withstood the repeated attacks of vastly superior numbers.